Mid-America Christian University is proud to announce Jim Lyon, Church of God Ministries general director, as the keynote speaker for the university’s semi-annual Spiritual Emphasis Week. Beginning March 21, Lyon will conduct a four-day stint of chapel services at MACU, expanding on the university’s twice-weekly sermons. Services will be held at 10 AM, March 21–24. In 2013, Lyon became general director of Church of God Ministries, providing leadership for the Church of God in the U.S. and Canada and networking with the church in eighty-seven other countries. 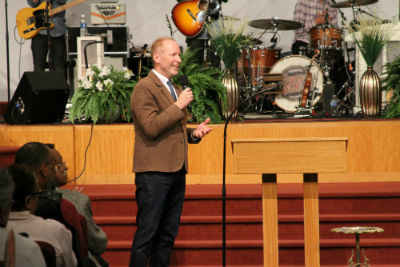 Prior to accepting the invitation to become general director, Lyon served as the senior pastor of Madison Park Church of God in Anderson, Indiana, for twenty-two years. An accomplished pastor, author, teacher and motivational speaker, Lyon has published two books and has hosted CBH ViewPoint, the English language broadcast of Christians Broadcasting Hope, since 1996. The program is heard worldwide and online every week. Lyon has been married to his wife, Maureen, since 1978 and is the proud father of four sons and grandfather to five grandchildren. MACU chapel services are open to the public and can be viewed online at macu.edu/watch. Archives are available for those who cannot attend or watch at the time of the sermon. Mid-America Christian University offers a Christian liberal arts education through two dynamic colleges. The College of Arts and Sciences (CAS) offers undergraduate degrees to traditional residential and daytime commuting students at the main campus in south Oklahoma City. The College of Adult and Graduate Studies (CAGS) makes college education affordable and accessible to busy working adults and graduate students. Degree programs are offered online or on-ground at the main campus or through MACU’s north Oklahoma City location. MACU is an endorsed agency of the Church of God (Anderson, Indiana) and is regionally accredited by the Higher Learning Commission of the North Central Association of Colleges and Schools. Visit www.macu.edu for more information. This entry was posted in All Church of God, Colleges & Universities and tagged Church of God Ministries, college, General Director, higher education, Jim Lyon, MACU, Mid-America Christian University, OKC, Oklahoma, Oklahoma City, speaker, spiritual emphasis week, university. Bookmark the permalink.